Dehydrators come in different construction – some are made with various types of plastic while the more expensive ones are made with stainless steel. The plastic dehydrators can be further broken down into two categories: standard “food-grade” plastic and BPA-free. The BPA-free food dehydrator is more popular because of concerns with BPA leaks or outgassing when exposed to higher temperatures. By making the food dehydrator BPA-free, companies alleviate these worries and health concerns. 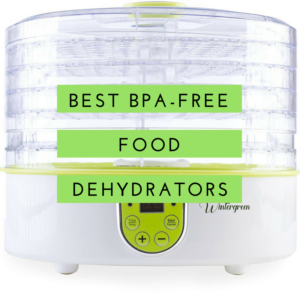 If you want to be better safe than sorry, here is a list of the Best 3 BPA-Free Food Dehydrators. All of these recommended products can be purchased on Amazon. If you have a bigger budget, you can check out the stainless steel dehydrators at the Best Commercial Dehydrators for Fruit and Jerky. What I like about it: The Nesco Snackmaster Pro Food Dehydrator is a BPA-free product from Nesco is the #1 best seller on Amazon for a reason – it effectively dries all kinds of food in hours (as opposed to days) without the high cost of a commercial food dehydrator. It’s a great addition to any kitchen and is perfect for first-time users. 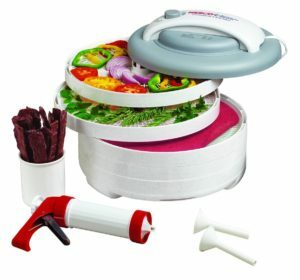 Simple to use, the Snackmaster will dry veggies, fruits, flowers, nuts and even jerky in a cinch! Users say they will never buy commercial jerky again. If you love a good homemade beef or chicken jerky, then purchase the Snackmaster Pro. For other recommended dehydrators for meat, check out our list of the Best 3 Food Dehydrators for Jerky. What I like about it: This all-in-one food dehydrator packs a punch even with its small size. The Snackmaster Pro’s little sibling offers the same features without the added bulk. Although it has lesser power, it leaves a lot to like. It makes dried apples, vegetables, and fruit leathers perfectly – and it even has a jerky gun if you want to dry meat. People also use this to make yummy snacks for toddlers – and even adults, I should say. Who does not like a more nutritious alternative to processed and junk food on the supermarket shelves? Made by Nesco, you are assured of good construction and quality. Plus, it is also BPA-free! 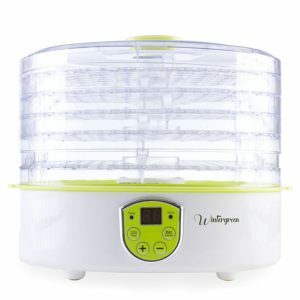 Why I like it: If you don’t extensively dry your food, then the Wintergreen Food Dehydrator BPA Free machine is sufficient for you. This dehydrator does the job without taking much counter space. You can even bring it with you on camping due to its small size. Customers love that this product is easy to clean – even to the laziest of all cooks. You can dehydrate vegetables, nuts, fruits and herb with less effort using this baby. 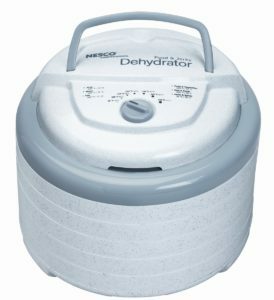 If you want a basic food dehydrator, then give this one a try! Want to eliminate food waste? Looking for a healthier alternative to store-bought snacks? Then by all means purchase a food dehydrator. If you think dehydrators are expensive, think again! Nesco and Wintergreen make the best food dehydrator BPA free products for an affordable price. If you are serious about drying foods and are looking for more power, check out our best commercial food dehydrator list.